Rick Luettich is RENCI’s chief domain scientist for coastal programs. He develops strategies on coastal issues ranging from marine environmental science to coastal hazards. He is a principal developer of the ADCIRC coastal circulation and storm surge modeling system, which has comprised the back bone of multiple US Army Corps of Engineers and FEMA forensic and planning studies in the Gulf Coast following hurricanes Katrina and Rita in 2005. RENCI uses ADCIRC as its disaster response storm surge model. 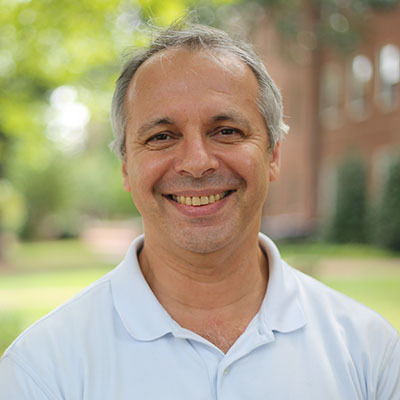 Luettich is also the director of the UNC Chapel Hill Institute of Marine Sciences, where he leads the Coastal Circulation and Transport (CCATS) Laboratory and conducts observational and modeling studies of coastal and estuarine circulation processes. He holds a joint appointment in UNC-Chapel Hill’s Department of Environmental Sciences and Engineering and an adjunct appointment in North Carolina State University’s Department of Civil Engineering. His research is supported by NSF, ONR, NOAA and the U.S. Army Corps of Engineers. Alex Tropsha, Ph.D., is RENCI’s Chief Domain Scientist for Molecular Informatics. He is also K.H. Lee Distinguished Professor and associate dean for pharmacoinformatics and data science at the UNC Eshelman School of Pharmacy (recently ranked #1 in the country by US News & World Report). His research focuses on computational drug discovery, cheminformatics, computational toxicology, and structural bioinformatics with the emphasis on methodology development and experimentally testable hypothesis generation. In recent years, his research interests have expanded toward materials and nanomaterials informatics and biomedical text mining. He has authored or co-authored more than 200 peer-reviewed research papers, reviews and book chapters, and co-edited two monographs. He is an associate editor of the ACS Journal of Chemical Information and Modeling. He holds joint appointments in UNC’s department of computer science and department of biomedical engineering and is a faculty member at the Lineberger Comprehensive Cancer Center. His research has been supported by multiple grants from the NIH, NSF, EPA, DOD, and private companies. Kirk C. Wilhelmsen is RENCI’s chief domain scientist for genomics. He is also a professor of the neurology and genetics department at UNC – Chapel Hill. Wilhelmsen’s research interests are engaged in the genetic mapping of susceptibility loci for complex traits and the positional cloning of genes responsible for neurodegenerative disorders. His major focus areas are genetics of non-Alzheimer dementia and genetics of addiction. Previously, Wilhelmsen worked at the Department of Neurology at the University of California, San Francisco. He received both his doctoral and medical degrees at the University of Wisconsin in Madison. Reagan Moore is RENCI’s chief scientist for Data Intensive Cyber Environments (DICE), coordinating collaborative research efforts between RENCI and the DICE group in the UNC Chapel Hill School of Information and Library Science (SILS) in areas such as the development of data grids, digital libraries, and preservation environments. Moore is also a professor with SILS. Prior to his RENCI and UNC appointments, he was the director of data and knowledge systems at the San Diego Supercomputer Center (SDSC) at the University of California, San Diego. Moore came to UNC Chapel Hill in August 2008 along with other members of the DICE research team. The team is known worldwide for its expertise in the development of digital data technologies, including open source software that enables sharing of data in collaborative research, publication of data in digital libraries, and preservation of data in persistent archives for use by future generations. Moore holds a Ph.D. in plasma physics from the University of California, San Diego. Arcot Rajasekar is chief scientist for data grid technologies at RENCI and another leader of the DICE team in UNC’s School of Information and Library Science (SILS). He was the director of the Data Grids Technology Group at the San Diego Supercomputer Center (SDSC) and is the lead designer of the Integrated Rule-Oriented Data System (iRods), a data grid system and open-source approach to managing digital data. Rajasekar leads data grid initiatives that involve both RENCI and SILS. He holds a PhD in computer science from the University of Maryland and has multiple publications in the areas of logic programming, deductive databases, data grids, digital library and persistent archives. He is also a co-author of the book Foundations of Disjunctive Logic Programming.